The no-till cinder block garden pictured here can be built in an hour or less once you have the materials gathered. 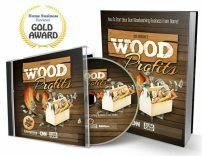 Cinder block gardens for vegetables, herbs and garden fruits are popular for those who like strong edges around their raised beds, but don't like to work with wood, nails and hammers. People also like the flexibility of cinder block gardening. You can start small and reshape or extend the garden little by little. 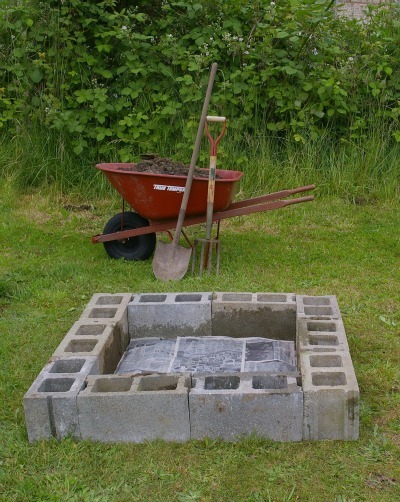 Also, the holes in the blocks are great for planting more invasive herb plants that produce highly aromatic leaves in a slightly less fertile soil than most vegetables prefer. Different soil can be put in the holes than what's used for the inside of the garden bed. And, with the herbs growing inside the hole, their tendency to rapidly spread can be held in check. 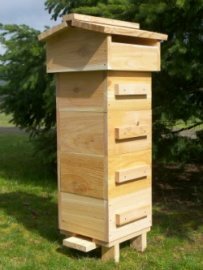 These herbs can double as bee and other beneficial insect nectar sources. You can also plant marigolds in the holes or other easy-to-grow flowers that are known to deter garden vegetable pests. Gather your materials: You'll need topsoil, at least a half dozen layers of newspaper, brown grocery bags, or your favorite weed barrier for the bottom of the garden, either your garden seeds or garden starts, and of course the cinder blocks. If you use weed barrier, you may want to make sure it's the kind that roots can permeate and earthworms can come up through. Fill in the cinder block holes either with topsoil, or a less rich combination of topsoil and organic potting soil if you're planting herbs that do better with less fertility. (Potting soil is often devoid of most nutrients). Plant your herbs or other plants in the holes. 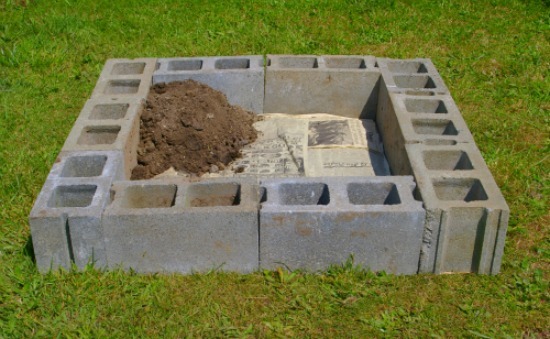 Another alternative to planting in the cinder block holes is to buy flat concrete toppers for the blocks. These cover the holes so no weeds can come up through them, and they make a nice place to sit while weeding or harvesting.